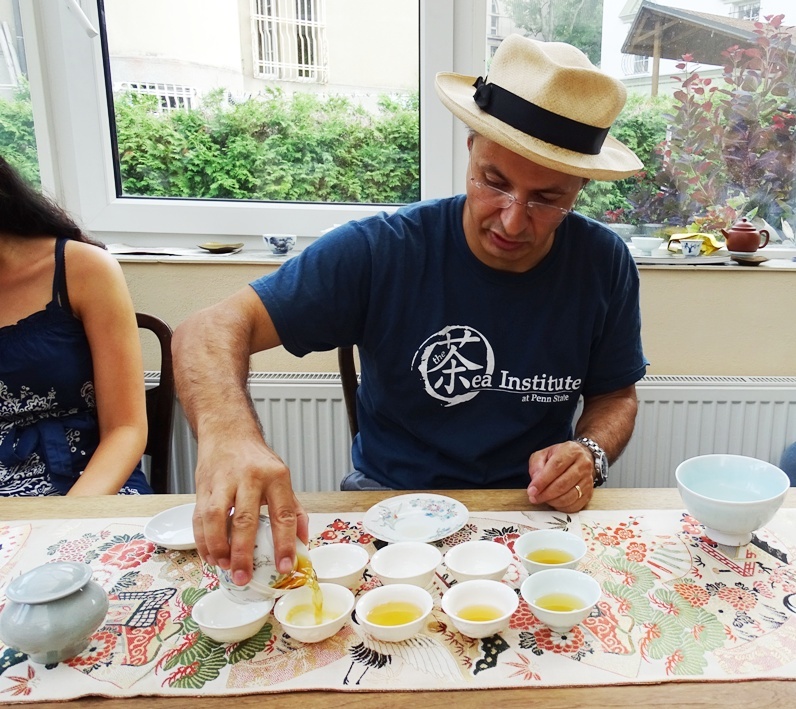 On Saturday, July the 18th, I taught my Oolong Brewing technique in Prag, Czech Republic. 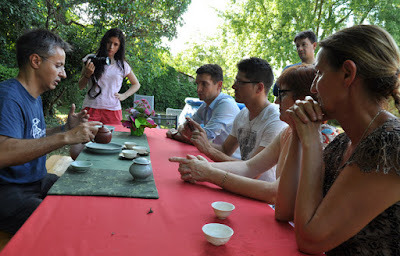 A long time tea friend, Zdenek, who runs the Longfeng.cz tea store invited me to teach his most passionate customers. One of them runs a tea forum and tea site. Another one writes a tea blog where he posted about the event. They are very quick learners and it was interesting to share my knowledge with them. I focused on gaiwan brewing, since a gaiwan is the perfect brewing vessel when you wish to learn about tea. It's cheap, easy to clean and, most importantly, its porcelain material is neutral and doesn't affect the taste of tea. 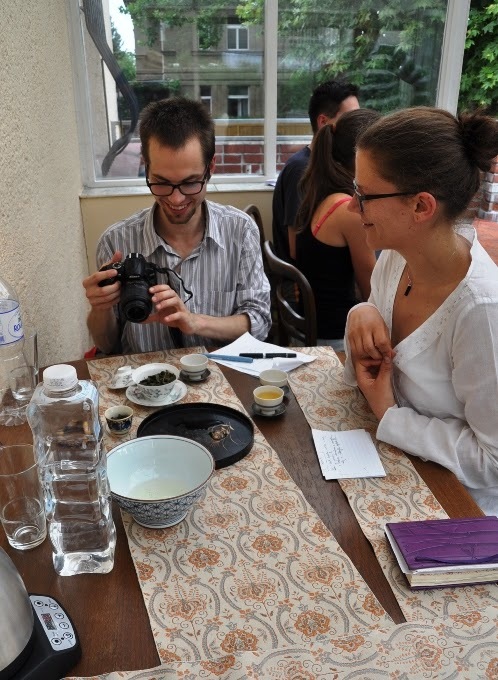 The participants wondered why I don't use a gongdao bei or cha hai or pitcher during this training. 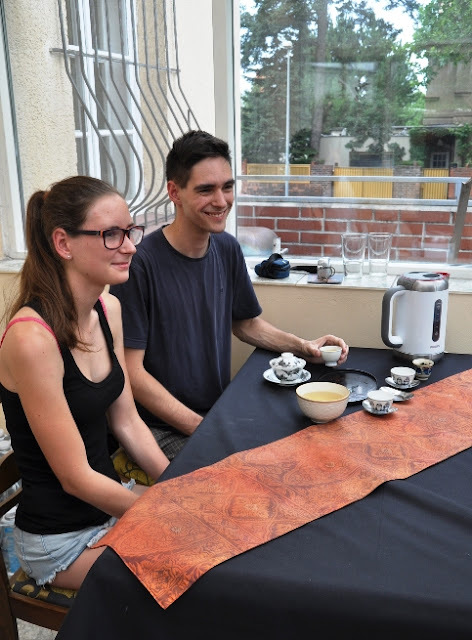 - Everybody receives the same concentration level of tea from the pitcher. 1. Scents. Every time you pour a hot liquid into another vessel, the temperature of the liquid drops a few degrees. Therefore, if you pour tea into a pitcher and then into the cups, it will be cooler than if you pour directly into the cups. This matters, because the hotter the tea, the more scents it releases. 2. Simplicity. Get rid of what's superfluous on the tea table. With a pitcher, you need 2 steps to pour in the cups. Without, you only need one step. 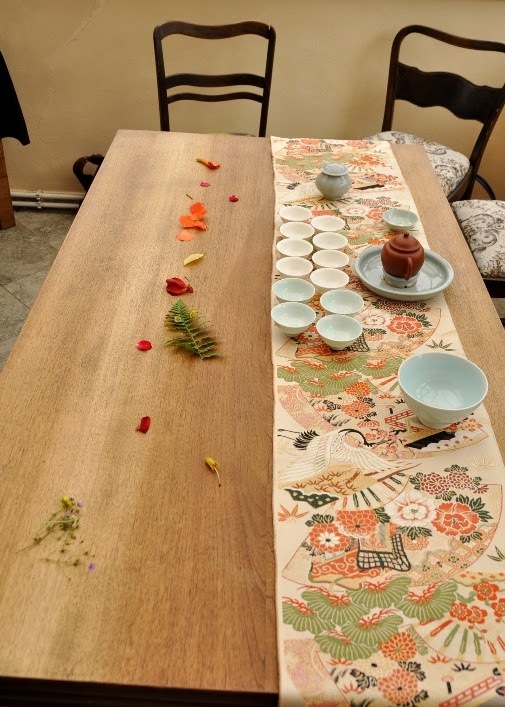 That's why there were no pitchers in the traditional Chaozhou gongfu cha. 3. Skill. Gongfu cha means 'skilled' tea. One of the skills of gongfu cha is pouring the tea into the cups. With a pitcher there's not much skill involved. 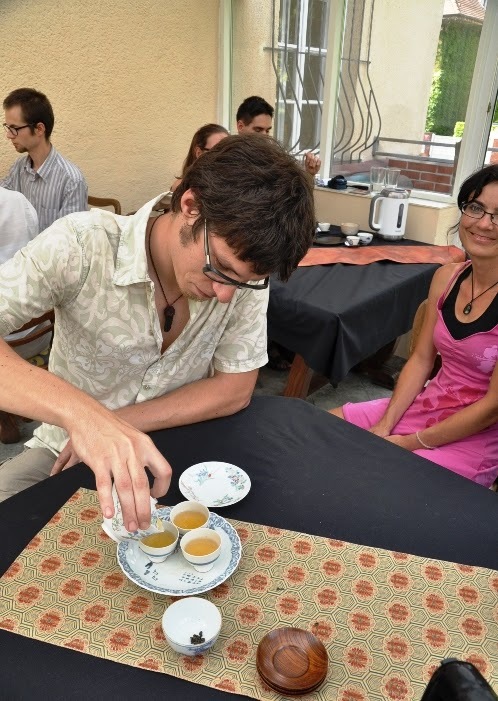 Pouring directly into the cups without spilling tea requires a good technique, experience and attention. At the same time, you must also make sure you share the tea evenly between the cups. 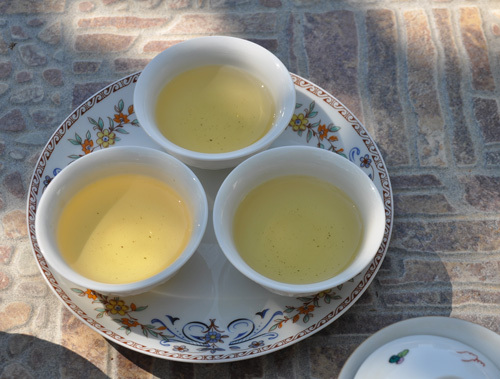 The proper way to do that is to partially fill 3 cups in this order: 1 half - 2 half - 3 full - 2 half - 1 half so that the cups receive the same tea concentration. 4. Flexibility. In theory, we aim at achieving the same tea concentration for all the drinkers. 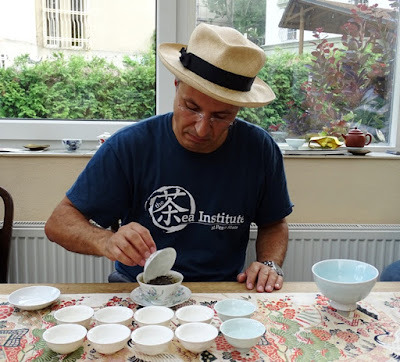 But if one of them likes it lighter than the others, then pouring directly in the cups allows us the possibility to pour different levels of concentration. In order to take this person's taste into account, I would pour 1 full - 2 half- 3 full - 2 half and give cup number 1 to the person who likes its tea light. 5. Focus. Trying you best to minimize the water/tea you spill while averaging the concentration and volume in the cups requires your full attention and a steady hand. It forces us to calm down and this also benefits the other aspects of the brewing (hot water pouring, feeling when the tea is ready, tea appreciation...). When I manage not to spill any tea outside the cups, I am often rewarded with a sense of flow, a beautiful sensation of harmony. And the tea from these cups feels particularly good. This is how tea gives you a direct feedback on your state of mind. Pouring from a gaiwan directly into cups is very difficult. 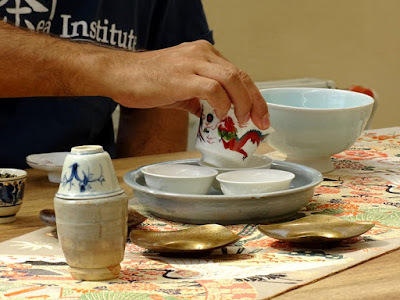 Using a teapot makes this much easier, especially if you have trained with a gaiwan first. Practice makes perfect. 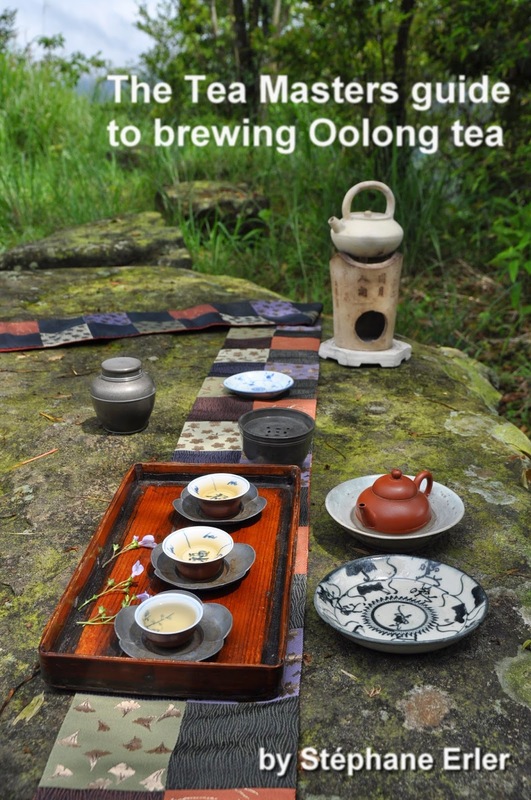 This full day of Oolong brewing went really well and we finished it with my 2001 Concubine Oolong from Yong Lung (Dong Ding). 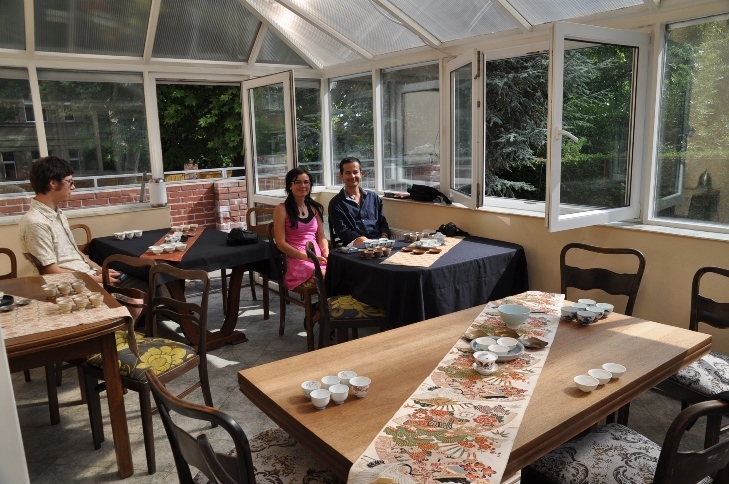 This was a perfect tea to share and to mark this special occasion that brought us together in this Prag winter garden. 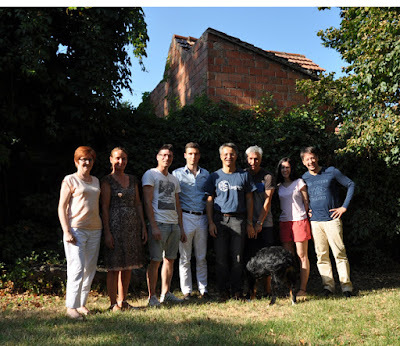 Thanks again to all the participants and to Zdenek for his very kind hospitality. Thanks also to Dzin TeaRacer for all the pictures where I'm on. 3. Puis cette Beauté Orientale faite avec du Da Pang également afin de sentir l'impact d'une oxydation plus intense. Cette rencontre fut aussi l'occasion de dialoguer et de répondre aux questions des amoureux du thé. La méthode que j'ai apprise auprès de Teaparker et que je pratique diffère un peu de ce qui se fait habituellement en Chine et à Taiwan. 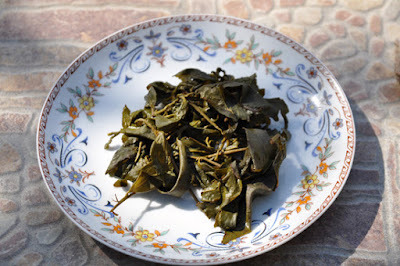 Les 2 différences les plus marquantes sont que je ne rince pas mes feuilles et que je n'utilise pas de cha hai/gongdao bei (pichet). J'ai aussi eu de nombreuses questions à Prague sur ces 2 points et j'essairai de récapituler tous mes arguments dans un article ultérieur (ou 2). 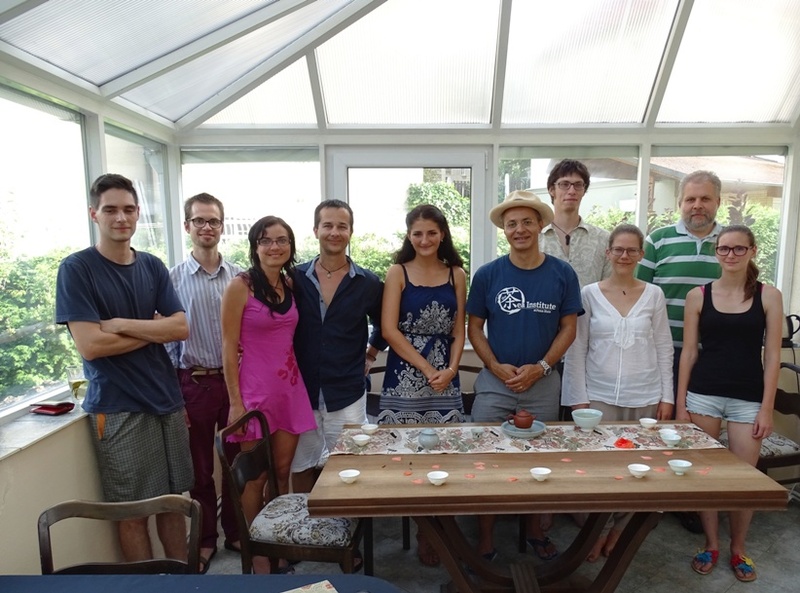 A midi, j'ai également fait une démonstration d'Oolong infusé en grand théière pour accompagner notre repas alsacien et hellénique (tarte flambée et salade grecque!) 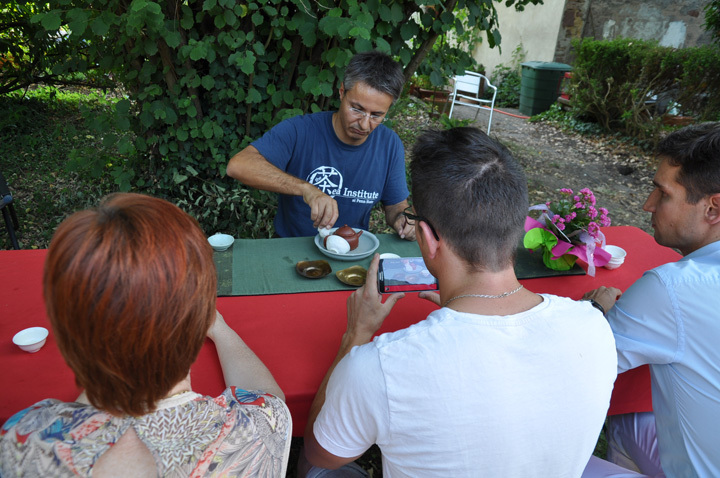 de manière détendue dans le jardin. 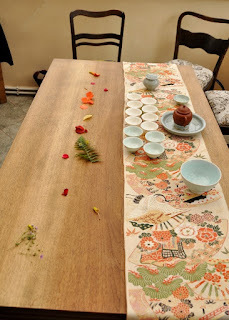 Puis, en fin d'après-midi, pour conclure l'apprentissage de l'infusion des Oolong torréfiés, j'ai fait cette démonstration d'un Chazhou gongfucha avec une théière en zhuni. Pour remercier tous mes participants, je choisis d'infuser ce Hung Shui Oolong de Dong Ding de 1999. Cet Oolong a des odeurs de vieux bois pour Gregory, mais son goût n'avait rien de vieux ni de frais. C'est un équilibre de force et de finesse, de douceur et de profondeur. 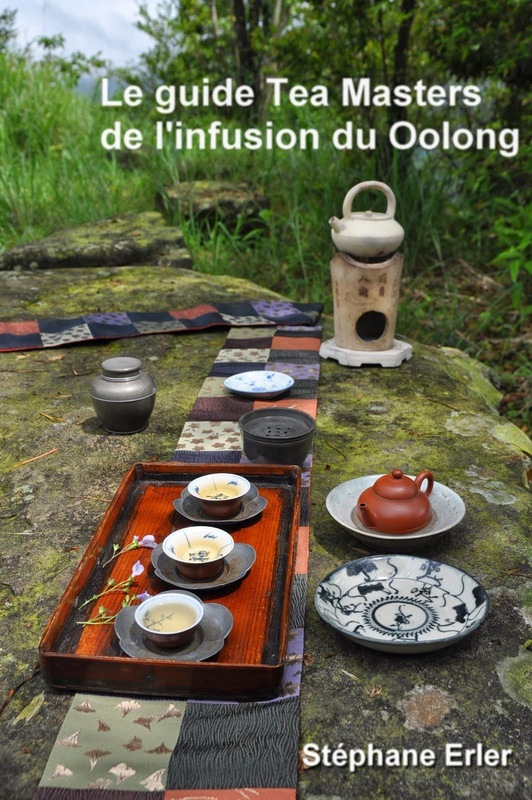 Il symbolise bien l'aspect bonification des meilleurs Oolongs. 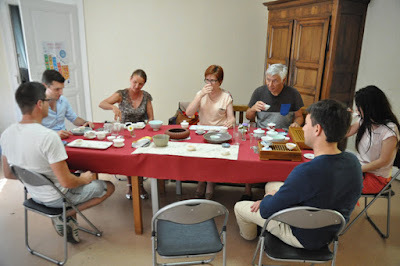 Merci pour cette journée Alsacienne autour du thé qui restera longtemps dans ma mémoire. 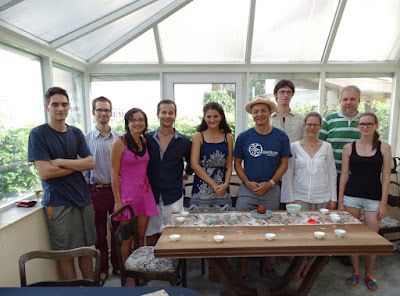 Je retourne ce soir à Taiwan, heureux d'avoir pu vous rencontrer et partager ma technique et ma passion du thé! 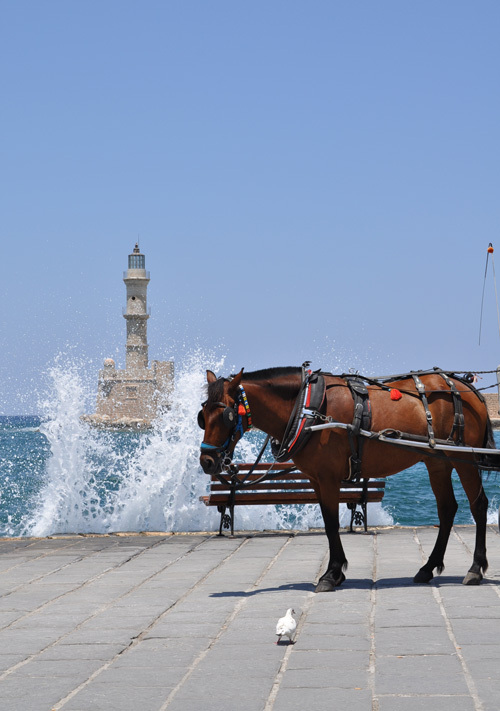 It's a hot summer in Europe, but there are lots of ways to escape the heat. 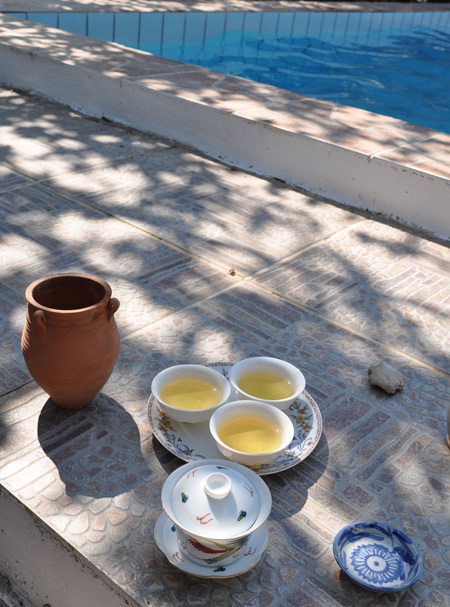 While the kids enjoyed the swimming pool in the Cretan villa, I prepared my tea in the shade. 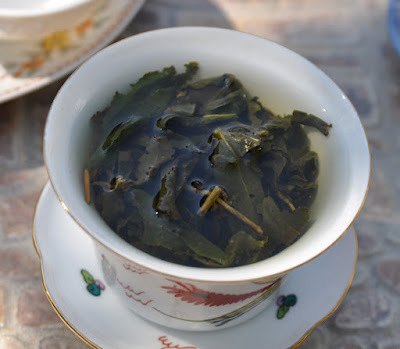 I chose a very special high mountain from Alishan, Changshu Hu. It's my winter 2014 Tie Guan Yin. The dry scent is not very powerful or very distinctive. 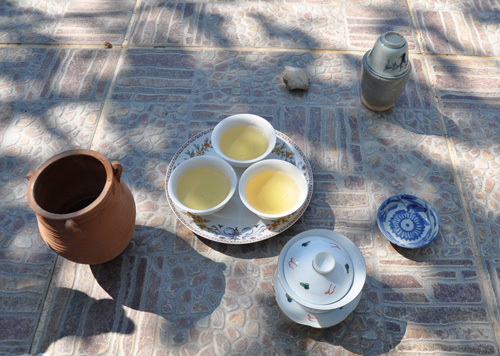 But once it's brewed, it's obviously different than a typical High Mountain Qingxin Oolong. 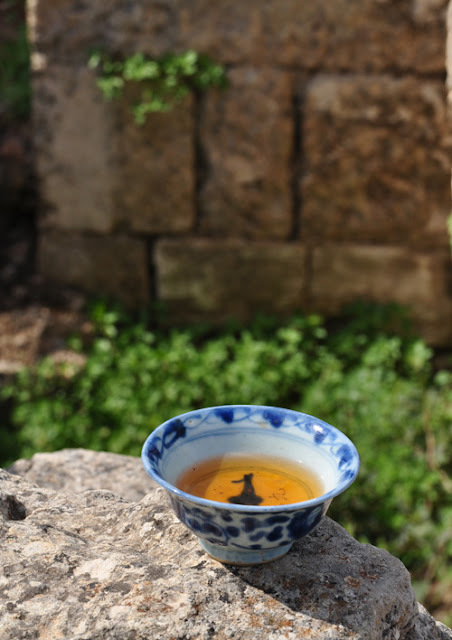 It combines the freshness, power and finesse of the high mountain with the flavors of Tie Guan Yin. The leaves are particularly big and the light golden color is a sign that it's not too lightly oxidized, despite coming from over 1500 meters elevation. 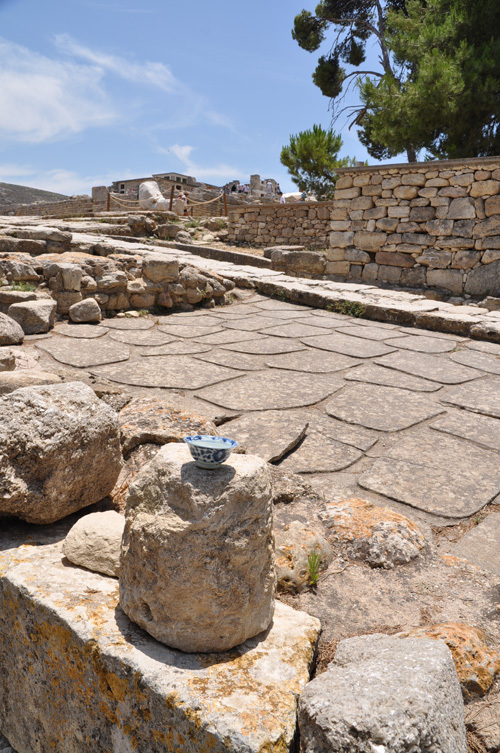 The villa has some nice porcelain plates, and I was glad to integrate them in my chaxi. 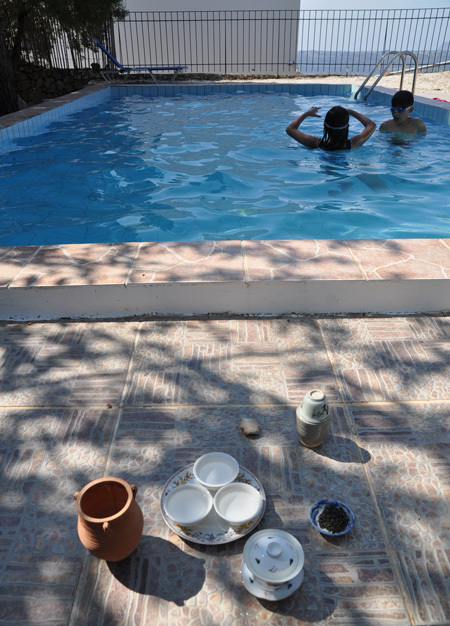 And the little terracotta amphora became my waste water container! This made this Chaxi Greek-Chinese and proved once more that the spirit of Chaxi is very flexible and can be adapted to any place and circumstance. Even by the pool! 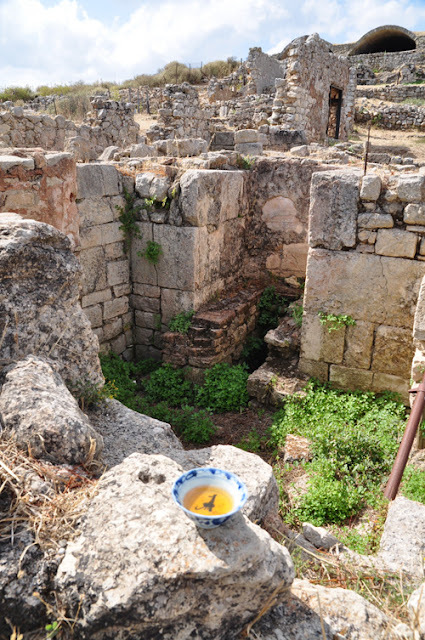 Un séjour en Grèce n'est pas complet si on ne visite pas ses ruines. Et je ne parle pas des banques locales, mais de monuments anciens! Ils nous rappellent que le progrès de l'histoire se fait avec des hauts et des bas. Ainsi, à Cnossos, on voit que la civilisation minoenne de Crète fleurissait déjà entre 2600 et 1400 avant JC! L'empire romain domina la Crète plus de 1000 ans plus tard et construisit ces bains et de larges citernes à Aptéra. Quel dommage qu'ils ne connaissaient pas encore le thé à cette époque, car cet endroit se prête bien à sa dégustation. Mais en Grèce il y a bien moins de nuages, si bien que le blanc y représente les vagues de la mer. C'est donc la combinaison du ciel azuré et de la mer. Si bien que le thé au milieu de la coupe y luit comme le soleil!